What if the slipper didn't fit? Experience the wonder and the majesty of Cinderella's classic fairy tale with a spectacular twist in Disney's all-new motion picture Cinderella III: A Twist in Time! When her evil stepmother gets hold of the Fairy Godmother's magic wand and turns back the hands of time, Cinderella must try to find Prince Charming and break through the new spell. Gus, Jaq and all your favorite characters return in an exciting and hilarious new take on one of the most celebrated films of all time. Bursting with show-stopping music and more magic, wonder and suspense than the original, Cinderella III: A Twist in Time is enchanting entertainment for the entire family! Although I’m not sure who really wanted to see any sequel to 1950’s classic Cinderella, 2007 brings us a third flick in the series. On the heels of 2002’s atrocious Cinderella II: Dreams Come True, we get Cinderella III: A Twist in Time. This flick picks up a year after the events of the original movie. Cindy (voiced by Jennifer Hale) and her Prince Charming (CD Barnes) celebrate a “perfectly perfect” year while her stepsisters Anastasia (Tress MacNeille) and Drizella (Russi Taylor) whine about their fate. Anastasia follows Cindy and discovers that our heroine accomplished her goals via the Fairy Godmother’s (Taylor) magic wand. Anastasia absconds with the special stick and presents it to her mom, Cindy’s evil stepmother (Susanne Blakeslee). Mom and Drizella initially think Anastasia’s off her rocker, but she manages to activate the wand and turns to Fairy Godmother to stone. This gives the stepmother some ideas. She uses the wand to reverse time and take all involved back to the moment when Cindy fit the glass slipper and nabbed the Prince. However, this time she uses the wand to shrink Anastasia’s enormous hoof to slide into the slipper. This allows Anastasia to become the Prince’s bride-to-be and sticks Cindy back into her role of oppressed victim. The rest of the movie follows these events and attempts to bring the world back to its true balance. 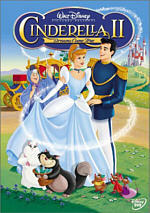 Cinderella II was a dreadful flick and one of the worst of Disney’s direct-to-video (DTV) sequels. In fact, it didn’t even bother to attempt a coherent narrative. Instead, it simply cobbled together three separate vaguely connected vignettes. Cheap and shoddy, it did nothing more than insult the memory of the original classic. While no one’s idea of a great film, at least Twist displays a little more ambition and class. It comes with an actual plot, and I must admit it presents an interesting idea. What if the Stepmother had managed to thwart Cindy in the first place – what would have happened? Twist views that possibility and features a mildly compelling tale along the way. Granted, one shouldn’t mistake “mildly compelling” for involving and absorbing. I didn’t actively dislike Twist, but I can’t say that much about it made it endearing. Really, once you get beyond the slightly creative story, you won’t find anything to make it particularly memorable. In truth, Twist fit squarely in the middle among other Disney DTV efforts. The best of these become their own entities and don’t feel overwhelmingly beholden to the source material. At the very least, they show decent charm and vivacity. None of that comes along with Twist. All aspects of it seem perfectly serviceable but no better. I can’t actively criticize the movie’s animation, voice acting or songs, but I can’t find anything memorable or particularly positive about them either. The movie leads along its path without much pain and that’s about the best I can say for it. If all of this sounds like faint praise, you’ve correctly interpreted my thoughts about Cinderella III. On the positive side, I liked the attempt to do something different with the story, and after the horrible Cinderella II, at least Twist marked an improvement. However, nothing else about the movie stood out to me. This is totally lackluster filmmaking. 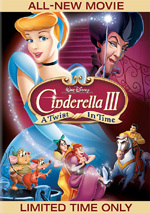 Cinderella III: A Twist in Time appears in an aspect ratio of approximately 1.78:1 on this single-sided, double-layered DVD; the image has been enhanced for 16X9 televisions. The film boasted a strong transfer typical of Disney’s animated efforts. Across the board, sharpness looked good. Very little softness appeared, as the flick seemed concise and accurate at all times. The movie came with no signs of jagged edges or shimmering, and edge enhancement also seemed absent. Don’t expect any source flaws, as the film was consistently clean and smooth. Colors looked terrific. The film showed a wide variety of lovely and accurate hues that always seemed warm and vibrant. They never betrayed any bleeding, noise or other flaws, as they appeared clear and distinct. Black levels also came across as deep and rich, while shadow detail was clean and appropriately opaque. I found no reason to complain about this excellent transfer. 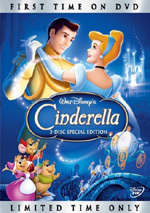 Cinderella III provided both Dolby Digital 5.1 and DTS 5.1 soundtracks. Twist showed virtually no differences between the two mixes; I thought the Dolby and DTS versions sounded identical. To my surprise, Twist went with a fairly active soundfield. In fact, I thought it was a bit too active at times. In terms of music, the audio tended to use the back speakers in a way that almost overwhelmed the mix. I think the rears should reinforce the score but not dominate it. I noticed the back speakers display of music a little more than I’d have preferred. However, this wasn’t a real problem, and effects were more satisfying. They used all five channels well as they spread the material smoothly across the spectrum. Storms and action sequences opened up the action well, and the package fit together nicely. This was a strong multichannel mix. Audio quality was very good. Speech sounded natural and concise, while music seemed lively and dynamic. The score boasted crisp highs and deep lows. The same went for the effects, as those appeared full and dynamic. No distortion appeared, and bass response was tight. I didn’t think there was quite enough on display here to merit “A”-level consideration, but I liked the track quite a lot anyway. A few minor extras fill out the set. We find a music video for “I Still Believe” by Hayden Panetierre. The forgettable tune comes accompanied by a mix of movie shots and clips of Panetierre as she wanders a neighborhood. It’s not as cheap as some of these videos – at least it looks like the Panetierre shots boast an effects budget – but it’s still boring. Two “Activities” come along for the ride. Biddidi-Bobbidi Choose is a game that forces us to hunt down a magic wand and then use it to find a secret room. This is an easy game that forgives mistakes. It may entertain little ones but I doubt many over the age of seven will dig it, and it comes with no kind of interesting reward. Cinderella’s Ballroom works only on DVD-ROM drives. This allows us to access the “Ballroom Scene Designer”. During that activity, you can create your own little party pictures. Those in the target audience may enjoy it, but that’s not me. Under “Backstage Disney”, we find two pieces. First comes an Exclusive Sneak Peek of Disney Princess Enchanted Tales. In this two-minute and 47-second clip, we simply see an excerpt from the DVD due in September 2007. The Making of Twice Charmed lasts four minutes, 59 seconds. In this show, we learn about the production that plays on the Disney Cruise ships. We get comments from Disney Cruise Line Entertainment director Jim Urry, Disney Creative Entertainment executive vice president Anne Hamburger, songwriters Michael Weiner and Alan Zachary, Disney Creative Entertainment director Shelby Jiggetts Tivony, and Disney Cruise Line president Tom McAlpin. This amounts to a long promotion for the show and nothing more. Blech! As usual, ads open the DVD. We find promos for Peter Pan, Ratatouille, Disney Princess Enchanted Tales: A Kingdom of Kindness and Tinkerbell. These also appear in the Sneak Peeks domain along with clips for The Little Mermaid III, Mickey’s Great Clubhouse Hunt and Blu-ray discs. If you expect Cinderella III: A Twist in Time to even remotely merit comparison with the original flick, you’ll leave your screening disappointed. While Twist improves upon the detestable Cinderella II, it doesn’t manage to offer much real entertainment. The DVD features very good picture and audio but suffers from negligible extras. Skip this forgettable piece of product.